What is Deadpool: Bad Blood? Deadpool: Bad Blood is comic written as an Original Graphic Novel. The story is Authored, Penciled and Inked by Deadpool's creator Rob Liefield who teams up with writers Chris Sims and Chad Bowers (X-Men 92) to bring Deadpool his first graphic novel. The story goes back to some of the character's 90s origins as well bring up a new nemesis to Deadpool in the character Thumper. 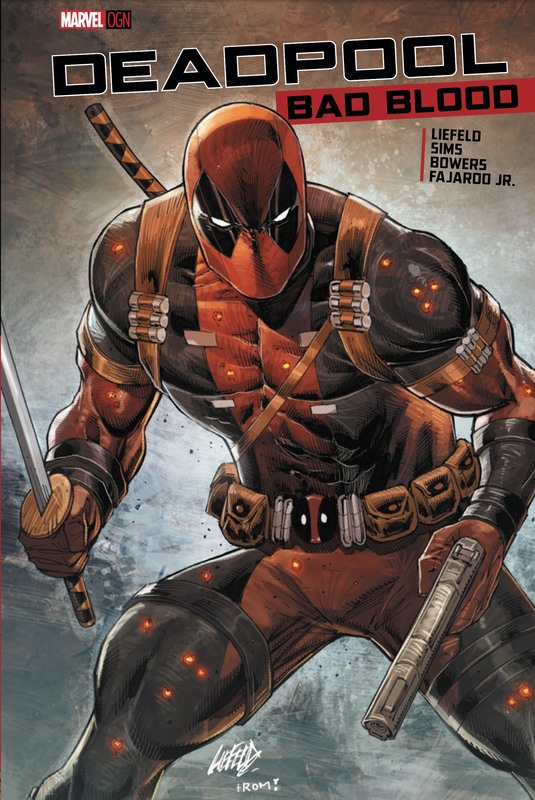 I actually think its amazing that Deadpool does not have an OGN already. However, Deadpool is kind of a weird character in that he was very popular with a small group of cult fans until exploding in popularity with the new film. There also have not been too many OGNs out so maybe this makes sense. I do think the OGN format is going to increase in popularity. The format is great for tablets and also for the crowds that pick up comics in Libraries that whole segment of readership has grown a lot in recent years. I am really excited for this one and am also really pumped that Rob is brought back for thi.s The writers of Sims and Bowers who did the fantastic X-Men 92 series also seem like a perfect fit. It all serves to make this OGN that much more special. In some sense it makes me happy there hasnt been another one because this just feels like Marvel is doing it the right way. For those of us that grew with Liefield on New Mutants and X-Force this brings back the old favorites of X-Force, Cable, Domino and even the Mutant Liberation Front. This is just classic 90s material that I can't wait to read through. I have not read this yet but will try to do so soon to get up a review. Until then here is the link to it on Amazon so you can check it out for yourself. Toylab is a member of the Amazon Affiliate program so we can bring you great deals directly from Amazon quickly like Snikt Snikt Snikt!!!!! Including Deadpool Bad Blood!!! That is right you can get it like Click Click Click!!!!! Description: Deadpool-more popular than ever before-in his first Original Graphic Novel! Deadpool's been shooting, stabbing, and otherwise annoying people for a long time now. He's made a lot of enemies. One that he can't quite place is the brutal Thumper, who keeps showing up out of the blue to pound him into jelly. What is Deadpool's past connection to this beefy face-masher? And what's up with Cable, Domino, and the others on the cover? Are they going to show up in the book? (Hint: They are!) Deadpool co-creator Rob Liefeld on pencils and inks teams with writers Chris Sims and Chad Bowers (X-MEN '92) to tell the tale of his greatest creation (just roll with me here) getting his heinie handed to him! Check it out-efore Deadpool checks YOU out! The evolution of Deadpool as cute and cuddly, and as a kid’s character is the funniest thing I ever saw. Cause on a certain level, he’s a murderer. He’s a killer, that’s what he does. His name is Deadpool. And then you get these adorable kids dressed as Deadpool with their swords and their guns, and it’s like, this is just funny. I’m seeing more Deadpool Pops and toys come across my table than comic books at this point. After all this time, I thought maybe we should invest a little more into a more sustainable villain. I was scared to tell Marvel that I was calling him Thumper, cause I thought they’d laugh at me, but they said “No, you’re good to go.” I guess it benefits me that Disney owns Marvel, so we can make the Bambi joke – and the segue from cute little bunny to a guy that pounds Deadpool into the pavement. The relationships are what interest me at the end of the day, and Thumper has ties to young Wade Wilson, back in the day. So this figure from his past, and how that relationship evolved, and the many times he’s encountered Deadpool in the past are really important to this book.